Housecleaning #5: Ok, who here is old enough to remember these? I was preparing to do my tonight's post when I ran across this comparison from fourth grade nothing. Ally is right when she says that tonight's product is nothing like the original. The originals were just awesome. They were a nice, big, proud frozen pudding that was a great snack. I want to say I was a big fan of the vanilla & chocolate swirl ones. I can still remember ripping open a box (just wish I could find a picture of one... here is another post complaining about the new pops). Ok, enough reminscing. Just like before we have 3 flavors. Chocolate, Vanilla, and Chocolate & Vanilla. 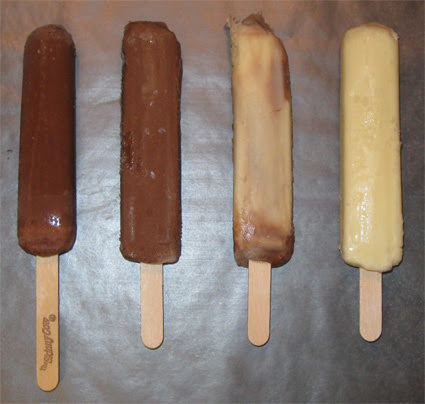 That's a skinny cow on the left, then chocolate, swirl, and vanilla. They definitely don't have the old shape. Now I've gone through the flavors twice now and I just don't like them. I think the Vanilla is the worst with it's artificial, cake batter like sweet flavor. It reminds me nothing of jello. The swirl benefits from the chocolate, but I still don't like it. Chocolate is ok.... at best. It's just that these things are such a bitter disappointment after spending so many great nights with the originals. Back in the day you would have one and be happy, sometimes you go back for a second. All these do is make me sad and do nothing to satisfy my hunger. For good measure I will polish off the last one as I write this paragraph. I remember the old ones having a bit of a solidness to them, almost as if they had a glaze of ice on them. These new ones are soft, real soft. The chocolate does taste a bit like a pudding cup and it's almost as soft. Here, let me prove it in pictures. That stain on the top is the skinny cow bar which I put out first. 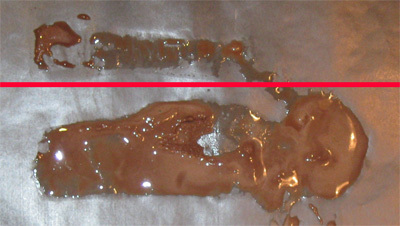 The bottom puddle is the pudding pop which I unwrapped second. Now that's just crazy melting if you ask me. Ok, I'm done the pop already. There's just no resistance from the pop and it disappeared in what? 90 seconds. 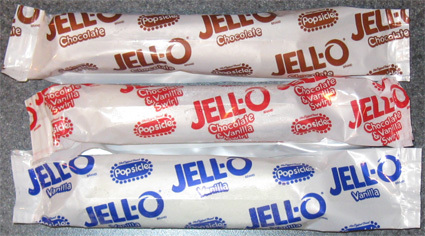 A pudding pop is meant to be cherished, not slurped up like some cheap milkshake. I guess you could argue that the liquidy nature of the pudding pop does a better job of coating your taste buds with faux chocolate flavor. As a disclaimer, I'm pretty sure I'm being kind of hard on these treats since I am not only sad that they got rid of the originals, but offended that these are the replacements. My daughter was still more than happy to dig into the box, and my wife thought they were decent. Tonight's winner : Skinny Cow : I'll take two of theirs over one of these any day. The losers : The cheezy remake, and therefore us, the deprived consumer. Oh man. 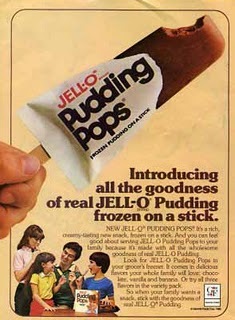 I loved the original Pudding Pops and I've wanted to find them somewhere. :( Sad to know that I never will. I too liked their shape and that small layer of ice on them. If I see these I might try them, but I won't have my hopes up. Thanks for the mention. I wish I could have an original Pudding Pop right about now!